First Home Dreams: I'll take the knock off for $25, Alex. I'll take the knock off for $25, Alex. 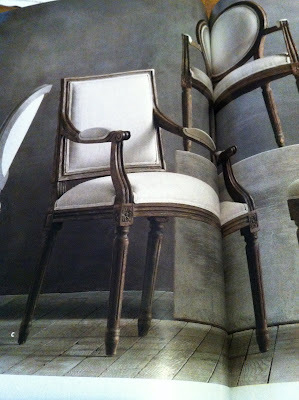 I received the mammoth that is the Restoration Hardware catalogue yesterday, and while I was flipping through, this guy caught my eye. This is essentially the exact same chair that I got at an auction last year. I fixed mine up a little differently, though. I really, really like the linen and weathered wood look of the RH chair, though, so perhaps I'll give that a shot? The four chairs I have don't need to match, because they are going to end up spread out all over the house anyway. Oh, in case you're wondering, the RH version *starts* at $249. 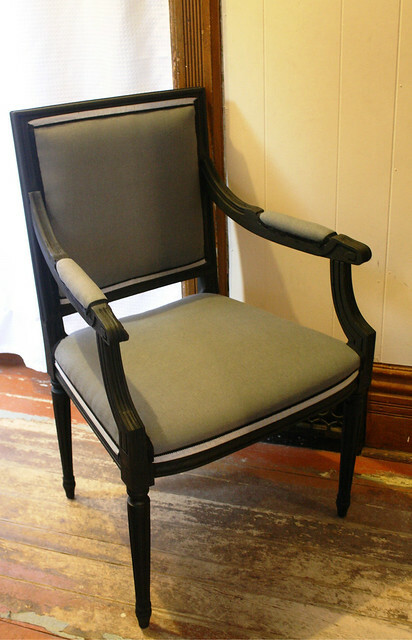 Including the cost of fabric and spray paint, I spent just over $25 per chair.